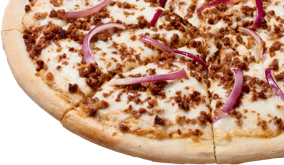 Starting with our spicy ranch sauce, loaded with 100% real, melty mozzarella cheese, fresh-sliced sweet red onions and finished with smoky, mouthwatering chorizo. 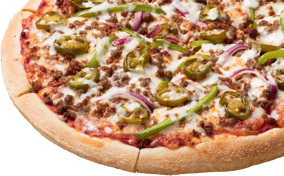 Loaded with 100% real mozzarella, crunchy green peppers, sweet red onions, ground beef, jalapeños and finished with spicy, smoky chorizo. So stacked with veggie goodness it’s practically growing. 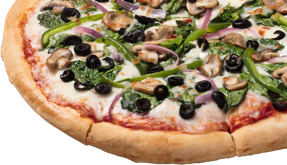 Special Roma tomato sauce, loaded with 100% real mozzarella cheese, crunchy green peppers, sweet red onions, mushrooms, fresh baby spinach and black olives. 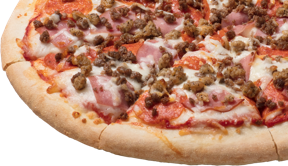 Pizza loaded with 100% real mozzarella cheese, zesty pepperoni, ground beef, savory ham, and finished with Italian sausage. No bull. 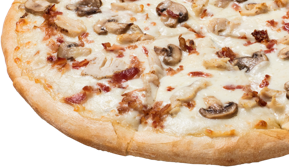 Soon to be your classic go-to call, The Chicken Bacon Classico is loaded with Alfredo sauce and 100% real mozzarella cheese, fresh mushrooms, grilled all-white chicken and piles of mouthwatering hickory-smoked bacon. 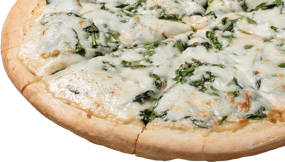 We put a new spin on spinach with creamy alfredo sauce, loaded with 100% real mozzarella cheese, topped with a hefty helping of fresh baby spinach and finished with extra portion of melty cheese. Supreme just got más supreme. 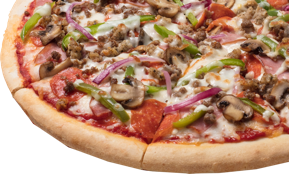 Loaded with 100% real mozzarella cheese, zesty pepperoni, sausage, ground beef, ham, mushrooms, crunchy green peppers and finished with some sweet, sweet red onions. 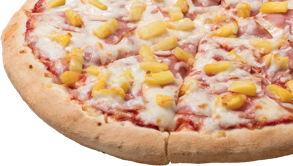 Say mmmaloha to extra helpings of 100% real, melty mozzarella cheese, down-home savory ham and sweet tropical diced pineapple. Es muy tropical.